Besoin de plus d'informations sur la réservation du logement 351650 ? Si vous louez une voiture (nous recommandons Autoreisen pour un meilleur rapport qualité-prix), elle peut être garée sur les immenses parkings latéraux et derrière le parc Santiago 1, ou sur un parking à proximité. Cependant, veuillez noter que cela peut être TRÈS difficile avant 17h en raison du grand nombre de visiteurs sur le front de mer. Des bus s'arrêtent à proximité et desservent tous les quartiers de Tenerife. Vous trouverez également une station de taxis à l'extérieur de "The Patch", située à moins de 100 ans. Lorsque le solde est payé vous sera envoyé par courriel avec une lettre d'information complète et détaillée qui donne un code d'accès pour la keysafe propriété, pour un accès facile et rapide à votre arrivée. Vous recevrez également un numéro de mobile pour l'équipe de gestion locale qui sont sur place pour répondre à toute question. C'est un complexe familial calme, inadapté aux clubs de nuit ou aux groupes de jeunes. Par conséquent, au moins un invité doit être âgé de plus de 30 ans, ce qui peut être vérifié à l'arrivée par passeport. Fumer n'est autorisé que sur le balcon. Des frais de nettoyage en profondeur de 100 £ s'appliquent si de la fumée est détectée à l'intérieur. Les modifications de date sont sujettes à la disponibilité et sont sujettes à des frais de modification de 50 £. Le départ tardif à 20h00, si disponible, coûte £ 50 et peut être demandé au plus tôt 2 semaines avant le départ. Myself and four others have just returned from this gorgeous apartment. Everything you could wish for is installed..The local bars and restaurants on your doorstep, what more could you want. We found hardly any noise from the local bars.. But then if you are on holiday who wants to go to bed too early. The balcony was a great place to watch the world go by and enjoy a morning coffee. The staircase up to the two other bedrooms and second bathroom was not a problem for one of our party who is in fact 76 years young. We did not have to use the A/C unit as a lovely breeze circulated throughout. We have now booked this apartment again as we did not want to miss out. Thank you Keith for making our holiday so enjoyable. Apt very clean, kitchen good, balcony was excellent. Downstairs area is ideally great for 2 people. Staircase could cause problems for children and older adults. The problem we had with the tv was promptly rectified. Downside to our stay was noise every evening from the restaurant across the road till at least 1am. Also, early hours of the morning bin collection. Réponse du propriétaire: Thank you for your review. All bedrooms are now double glazed and the bars are obliged by law to stop all music at midnight, and close completely at 1am. Perhaps there was a special Christmas party on when you were there in December.. I have never heard a bin collection in all the years I have been going there. Always best to sleep with the patio doors closed for a good night's sleep. There is aircon in the rooms. We arrivied in Tenerife on 29th June and where dropped off at our apartment. First impression was very impressive and with keiths detailed letter off where to go and ease of locating the apartment and getting in was very good. When we got into the apartment it didnt disappoint. Very big airy apartment with plenty off space for our party off 4 adults and two kids to sprawl out and settle in. The balcony was amazing and great views from all angles. We spent many evenings relaxing on it watching the sun set and the hustle and bustle off the street below. Bedrooms all good sizes and good storage. Kitchen was modern but only one complaint lack off saucepans and some kitchen utensils. The complex was brilliant and very clean and our kids had a ball in the pool. The pool bar is highly recommended with good food, happy hour from 3pm and nice staff who couldnt do enough for us. Another small gripe sunbeds expensive at 3.5 euro, if you want mats and umbrella again at a cost this was only downside and was costly spending time at the pool everyday. 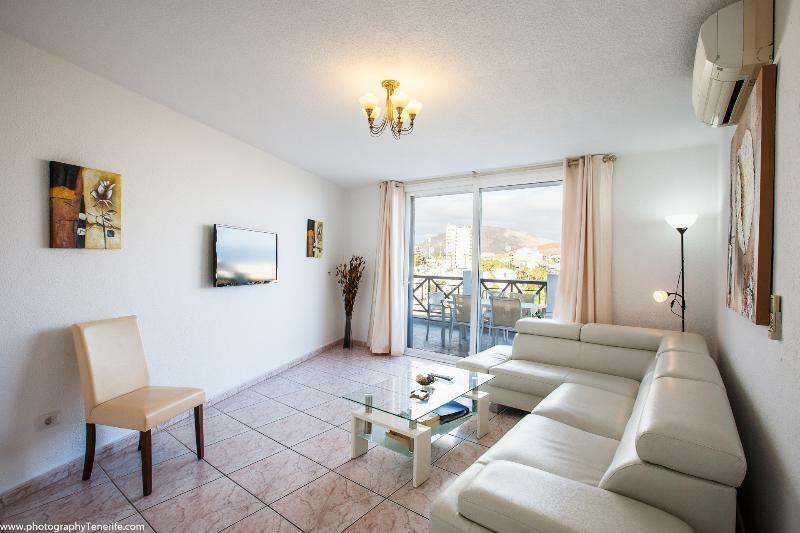 I would highly recommend booking this large airy apartment for the space, central location and enjoying all that Tenerife has to offer. Will hopefully get another stay in the future. Thanks keith for letting us rent your amazing apartment it made the holiday. Réponse du propriétaire: Thank you for this review. There were 3 saucepans in the separate pan drawer when I was there a few weeks ago. I will ask the management company to check on this today. This beautiful apartment is all you need for a perfect holiday. It has large balcony where you can have breakfast and lunch every day. I've just spent a week at this lovely apartment with my husband, 3 kids and my Mum. The apartment is modern, spacious and has everything you need and more! You can see the sunrise from the huge balcony. I was a little worried about my kids safety on the spiral staircase but I warned them to be careful and to always use the handrail, they always did and they were fine. The WiFi is good in both the apartment and the pool. The complex the apartment is situated in is great! My kids loved the pool and we all enjoyed the food and drinks from the reasonably priced pool bar. Lots of good bars and restaurants on the doorstep too. We had an amazing holiday! I would highly recommend this apartment! Just returned from a lovely week in las Americas at this very spacious well equipped apartment. Very large balcony with nice views of the mountains and sea. Nice to have air conditioning. Very central location with everything you need literally at your doorstep. Swimming pool area very clean, and prices at the poolside bar very reasonable. Beach only a 5 minute walk away. Would definitely return. There were 7 of us here, one being a two year old in a travel cot which we hired. We all had a great time and didn't want to return home. Thank you Keith. Myself and five friends spent a week in the penthouse apartment . its a lovely apartment .and having two bathrooms was a bonus . The bedrooms were spacious and comfortable. The best bit for us all was the balcony ,it gets the sun most of the day.,plenty of room for us to sit comfortably,and with great views. We all hope to come back here next year. Vous pouvez prendre contact avec Keith (le propriétaire) grâce au formulaire de contact sur cette page. Envoyez un email à Keith (le propriétaire) à l'aide du formulaire de contact situé sur cette page. S'il y a un numéro de téléphone sur l'annonce, vous pouvez également contacter le propriétaire directement. Comment contacter Keith (le propriétaire) ? Ou vous pouvez contacter le propriétaire et demander un devis par le biais du formulaire de contact. Keith (le propriétaire) vous enverra le prix total de votre réservation et vous indiquera comment payer. Envoyez un message à Keith (le propriétaire) par le biais du formulaire de contact pour demander un devis pour les dates qui vous intéressent. Keith (le propriétaire) vous enverra le prix correspondant à ces dates et vous indiquera comment payer. Keith (le propriétaire) est responsible pour la gestion de la caution sur cette propriété. Les conditions concernant la caution devraient être décrites dans le contrat de location. Veuillez en référer au contrat et contacter Keith (le propriétaire) directement si vous avez des questions. Vous devrez prendre contact avec Keith (le propriétaire) pour annuler. Il a dû vous fournir ses coordonnées au moment de la réservation. Si ce n'est pas le cas, contactez-le depuis le formulaire de contact, sur son annonce. Vous devez contacter Keith (le propriétaire) pour modifier votre réservation. Il a dû vous fournir ses coordonnées au moment de la réservation. Si ce n'est pas le cas, contactez-le depuis le formulaire de contact, sur son annonce.